This morning, the DC Audubon Society made a trip down to two sites in Prince William County, Virginia. The first, Cockpit Point Road, runs through power company land that is a mix of open fields and upland forest. 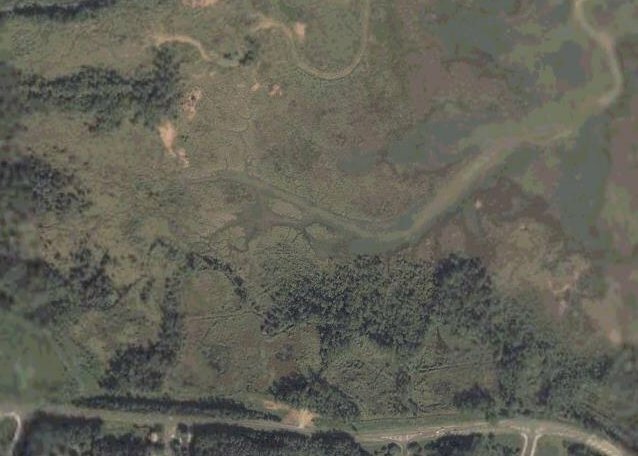 The second, the Julie Metz Wetlands near Leesylvania State Park, consists of bottomland forest and marsh habitats. The combination of habitats at the two sites made for a good morning of birding. We saw far too many birds today for me to talk about all of them, or even all of the highlights. Migration does appear to be picking up, even if the numbers of individuals are still somewhat low. The morning started off cool and overcast when we gathered at the intersection of Possum Point and Cockpit Point Roads, but by late morning the clouds burned off, and a blue sky appeared. I had one life bird on this trip, a yellow-throated warbler. It was singing near the top of a pine tree along Cockpit Point Road. With some help, I got a look at it. The yellow-throated warbler's color pattern is somewhat similar to the yellow-rumped, except that it has a yellow throat, and no yellow rump or epaulettes. In the same area, there were a prairie warbler, field sparrow, both orchard and Baltimore orioles, and a summer tanager. The prairie warbler has one of my favorite songs in the warbler family. Further down the road, we started finding more warblers. First, a worm-eating warbler sat right over the road and sang; one could not ask for a better view. Northern parulas and black-and-white warblers sang along the length of the road. A couple spots had black-throated greens singing, and in one spot we got a look at a male black-throated blue. Near the end of the road, there was a singing Louisiana waterthrush, but no one could locate it for a close look. And of course we had other songbirds - my first scarlet tanagers of the year, some singing indigo buntings, and plenty of singing wood thrushes and blue-gray gnatcatchers. In just a few days, red-eyed vireos have become ubiquitous. On the drive back out towards Route 1, we added hooded warbler and yellow-breasted chat along the side of Possum Point Road. As far as I know, no one ever saw the hooded. But in response to some pishing, the chat flew out of the bushes and perched in the open. Chats have very distinctive calls, which combine a lot of odd sounds. They are even less musical than gray catbirds. At Julie Metz, we added yellow-throated and warbling vireos, barn and tree swallows, and an American redstart. A short boardwalk trail led to great views of yellow warblers and common yellowthroats, two boldly-colored and unmistakable warblers. Though our group had dwindled down to four, a few of us went to look for a king rail, and were successful. Unfortunately we did not get to see it, but we did hear its call clearly and repeatedly. I had never birded at either location before today, so I was not quite sure what to expect. After this morning's walks, I could see that these sites are very good even on average days, when there has not been much overnight movement. I can only imagine what these sites must be like after a heavy influx of migrants. There has not been a whole lot of bird movement lately because we have had a steady flow of northerly winds. These seem to be pushing most of the migration through the Midwest. Still, there is a trickle moving through, and if you look in the right places, you can find some of them. This morning I went to the National Arboretum to see what could be found there. Most of the warblers present in the woods today were yellow-rumpeds. It seemed that every time I looked up at a small bird moving through the canopy or understory, the bird turned out to have the distinctive yellow epaulets and black breast streaking of a yellow-rumped warbler. Part of the challenge of birding in late April is being able to sort through the maze of yellow-rumpeds to find the less common warblers; this is a skill that I am still learning. I do not mind the masses of Dendroicae coronatae, though, because their song makes a very pleasant backdrop for a morning of birding. After getting a great look at an ovenbird in the Azalea Gardens, I started finding some first of the year birds for myself. First off was a singing black-throated blue warbler - one of my favorites. It sat on an open branch just long enough for a quick look; I saw one at a better angle later on. Northern parulas and black-throated green warblers were not new to me, but a beautiful rose-breasted grosbeak was. The grosbeak perched on a branch very close to the brick enclosure on the southeast side of the Azalea Gardens. In the meadow outside Fern Valley, there was an orchard oriole singing. This was a first-summer male - yellow with a black face. Fern Valley itself did not turn up much, but when I emerged from the other side and walked along the road towards Heart Pond, I heard a yellow warbler singing in the vines across the road from the pond. After a brief search, I saw it perch on a branch and sing. These are such beautiful birds. My last new bird for the day was a blackburnian warbler on the top of Hickey Hill. Unfortunately I was not able to find it for a good look, but the fast-paced, high-pitched, ascending song is hard to mistake for anything else. Finally, a couple notes.... There were quite a lot of house sparrows in the Azalea Gardens - maybe about 30-40. I find this disturbing because I have rarely seen house sparrows there before today. They appeared to be gathering food and nesting materials, which means they may be moving into cavities that would be used by other birds.... Towards the end of my walk I saw two adult bald eagles flying in close formation near the columns. The two birds were making high-pitched calls and following each others movements almost exactly. It seems rather late for eagles to be starting mating, but this did look very much like a courtship display. I guess the alternative explanation would be a territorial showdown. Our legislators yesterday put on a show of endorsing the conservation of fossil fuels at local Capitol Hill gas stations. Senate Democrats blamed Republicans for high gasoline prices, while House Republicans gathered around a hydrogen-powered van as a fossil fuel alternative. In both cases, once the event was over, the pontificating lawmakers drove back to their offices - only a few blocks away - in gas guzzling automobiles. House Speaker Dennis Hastert had the most embarrassing incident. Hastert, who appeared to have walked to the station, left in the very fuel-efficient vehicle, apparently headed for his office. But he went only a block or so before he got out and stepped into his pre-positioned gas-guzzling armored SUV to take him back to his office. Alert photographers, suspecting a ploy, had followed the speaker and captured the bait-and-switch. 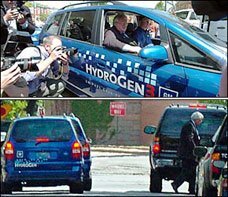 Hastert spokesman Ron Bonjean , showing why he deserves a raise, explained that Hastert "wanted to ride the van" -- really he did -- "to show his commitment to new energy-efficient vehicles." The problem, Bonjean said, was that Hastert's security detail wouldn't have it. Way too dangerous. Perhaps the security folks thought the vehicle was related to the ill-fated Hindenburg? In any event, "the security officials demanded that he ride in the much more secure armored SUV," Bonjean said. The truth is, lawmakers think nothing of wasting fuel because everything they do is paid, either by the government or by the lobbyists who entertain them and fly them around from one place to another on private jets. Perhaps stripping away this cocoon would lead to more responsible policies. Update: Welcome, Wonkette readers! If you liked this post, please take a look around the rest of my blog. Some of my better posts from the past are linked in the left sidebar. In the past two years, the white pelican colony at the Chase Lake NWR in North Dakota has been marked by turmoil: in 2004, tens of thousands of pelicans inexplicably abandoned their nests; in 2005, a high chick mortality led the parents to leave. This year, about 16,000 white pelican adults have returned to the refuge. Whether this year's breeding will be any more successful remains to be seen. An oil spill in Delaware Bay is affecting key shorebird migration habitats along the Delaware coastline. Birds that use these beaches include the declining red knot. While shorebirds are not expected to arrive in large numbers until about May 10, some early migrants are already arriving, and may have their ability to reproduce impaired. Kevin Karlson, author of a new Shorebird Guide, answers questions about birding by impression. The western snowy plover will remain on the endangered species list, for now at least. This is one of the few instances of the Fish and Wildlife Service acting in favor of protection in recent years. The Adirondack Regional Tourism Council has a new page devoted to Birding in the Adirondacks. As many of my readers know, I regularly cross-post some of my blog posts at the Blue Ridge Gazette, a group blog on life and culture in the Appalachian Mountains. While I have never lived in the mountains, I contribute essays on birds that may be found both in my city and in the mountains. This is the basis for my Birds of the Mid-Atlantic series. Recently, the contributors to the Blue Ridge Gazette blog founded an online magazine on the same subject. The magazine is a collection of the best posts from the blog, and it is published once a month. The online Blue Ridge Gazette magazine is now in its second issue. Go there if you have an interest in life in the mountains, and while there, take a look at the first issue as well. I and the Bird #22 is up at Home Bird Notes. Homebird birds the world without leaving home through the magic of the internet. My mother was just in town for a few days, so we visited a couple of prime D.C. birding spots. 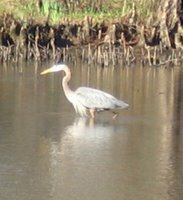 Yesterday it was Rock Creek Park, to see warblers and other songbirds; today it was Kenilworth Park and Aquatic Gardens, to look for some good birds that were reported on MDOsprey. As it turns out, we saw quite a lot today between the two locations, and some of the reports bore fruit. We started in Kenilworth Park. 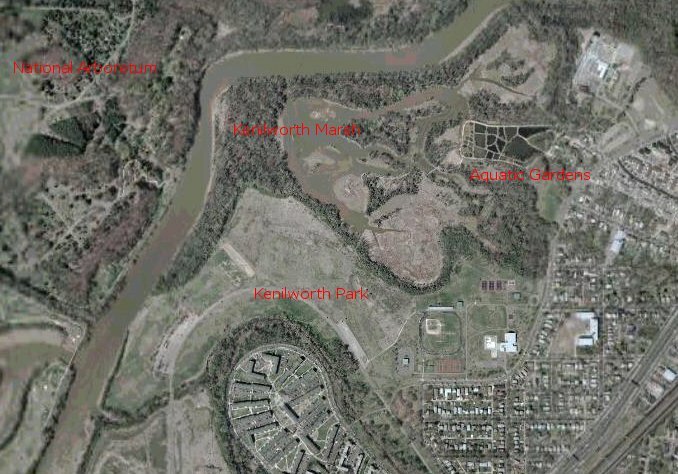 As Nick noted a few days back, Kenilworth Park and Kenilworth Aquatic Gardens are not the same entity. 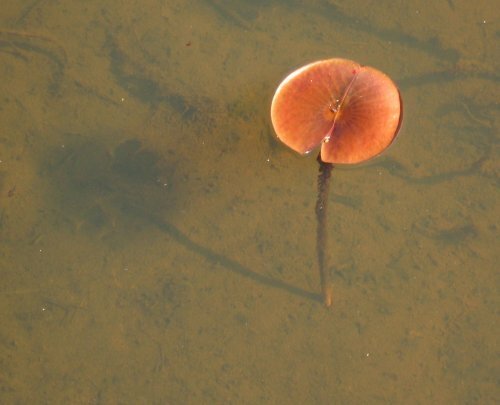 The Aquatic Gardens is a special national park devoted to the propagation of water lilies and other aquatic plants, and also shelters Kenilworth Marsh, one of the few viable tidal wetlands in DC. Kenilworth Park is a public park with football fields, playgrounds, and a recreation center. 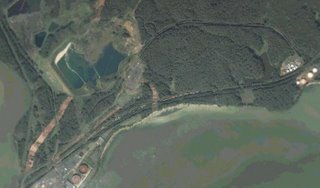 Click the satellite image at right to see the locations (courtesy of Google Earth). Several birds of interest for DC birders had been reported there: vesper sparrow, savannah sparrow, grasshopper sparrow, horned lark, eastern meadowlark, blue grosbeak, and glossy ibis. The grasshopper sparrow, horned lark, and glossy ibis did not make an appearance while we were at the park today, but the others did. 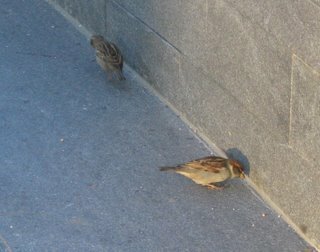 The first, a couple of vesper sparrows, were with a flock of savannah sparrows in the grassy border between the second parking lot and the river. The two were squabbling with each other, as had been reported by two previous birders; the squabbling provided a clue to identification - while in flight, the two vespers gave a buzzy call note, unlike the savannah sparrows. The blue grosbeak sat out on top of a short tree in the heart of the no-mow area and sang its heart out. My previous sightings of this species had always been backlit and poorly seen. This one was front light, with its deep blue body and rufous wingbars shining in their full glory. It was impressive even at a distance. Close to where we saw the grosbeak, a few meadowlarks flushed from the managed meadow and landed some distance away. These two birds and the vesper sparrow were all DC firsts for me. Also at Kenilworth Park were a singing white-eyed vireo and a singing blue-winged warbler, both in the remediated landfill beyond the concrete barriers (visible at the lower left of the photo above). The aquatic gardens had quieted down considerably by the time we arrived there. Birds were still singing, but they had settled into their mid-morning routines. One juvenile red-shouldered hawk was being harrassed by crows near the building complex. Later this hawk was involved in an aerial confrontation with two adults (its parents? ); having lost, it took out its frustration by harrassing a few turkey vultures that happened to be passing by. In addition to the usual goose contingent, the marsh held four northern shovelers (three males and one female). This was a DC first for me. Near the end of the river trail, there were two blue-winged teal, another rare-for-DC water bird. Yellow-rumped warblers could be heard singing in both Kenilworths, and a few singing northern parulas and common yellowthroats were audible as well. Shorebird diversity is increasing; this week I saw my first spotted sandpipers of the year, first on the Mall on Monday and today at the aquatic gardens. It was a gorgeous day despite a cold start. We had sunshine, blue skies, and plenty of birds. A few days ago I posted a link about some ornithologists that created a list of the most beautiful birds in North America. Nuthatch commented that this had the makings of a meme, and I think that is a great idea. So now that migration is underway and most birds are appearing in their finest spring breeding plumage, what do you consider the most beautiful birds? I feel like I could do a list with just warblers on it, but there are many other winged creatures to consider. I covered the ridge and maintenance yard areas at Rock Creek Park this morning. The park was not quite in full-migration mode, but there were still a number of good birds to be seen. Yellow-rumped warblers were dripping from the canopies in places, or at least it seemed that way. Their songs could be heard everywhere I walked. Ruby-crowned kinglets were singing in many areas as well. A few black-and-white warblers and a northern parula were working the trees on the bridle path near the horse center. Further down the bridle path towards picnic areas 17/18 were a veery and hermit thrush, with wood thrushes and ovenbirds singing in the distance. Black-throated green warblers sang near the picnic areas, but none showed themselves. A few palm warblers, a red-eyed vireo, and a great-crested flycatcher sat in a tree near the equitation field. The maintenance yard was full of goldfinches. There must have been several dozen gathered in one big flock in the trees above the marble blocks. All of them were chattering noisily. At least one blue-winged warbler sang from the shrubs in the back corner, but it did not come out for a viewing. Oddly enough, two swamp sparrows were working the slope below the porcelainberry vines; usually I would expect them in a wetter habitat. Nature notes: One red fox was visible in the woods between the equitation field and picnic areas 17/18. ... Horsechestnut trees seem to be very popular with songbirds of all types right now. I guess they must be producing a fruit that attracts either birds or insects for birds to eat right now. ... The woods and meadows are covered with garlic mustard. The place names given above refer to the names given to sites in Rock Creek Park by park staff and birders. To see the locations of most, refer to the park map (pdf). Update: The WMATA is still taking public comments on the proposed changes. The X6, one of the routes scheduled for elimination, is my primary way of getting to the National Arboretum when I want to go birding there. Without the X6, my birding patterns may change considerably, as the trip there will become longer. Many of the late night trips to be discontinued are on major bus routes that run across the District. These routes are usually the only way to get around town after the subways stop running (midnight on most nights). Financial problems are endemic to the Metro system, one of the few major transportation networks in the country that lacks a dedicated source of revenue. Metro must beg for new funds each year from the three jurisdictions that it serves (DC, Maryland, and Virginia). These three have different ideas about their relationship with Metro and competing transportation goals. The many resulting disputes hold up needed projects and funding. From that perspective, the need to cut costs is understandable. But the elimination of routes will undercut the core purpose of Metrobus - serving sections of the city where the subways do not reach and at times when the subways do not run. Comments will be accepted verbally and in writing at the public hearing or via e-mail. All organizations or individuals who desire to be heard with respect to the proposed fare and fee changes or select bus route elimination can present their views. To establish a witness list, individuals and representatives of organizations who wish to be heard at the public hearing are requested to furnish their name, address, telephone number and organization affiliation, if any, to: Office of the Secretary, Washington Metropolitan Area Transit Authority, 600 Fifth Street, NW, Washington, DC 20001 or by e-mail at public-hearing-testimony@wmata.com. For more information on the hearings, see the hearing docket and methodology. Please submit only one speaker’s name per letter and refer to Hearing No. 519 (April 5), 520 (April 10), 521 (April 11) 522 (April 25), Docket B06-2 in the heading. Written statements will be accepted through May 1. I cannot attend this hearing, but I have submitted my own comment for consideration. My email to the WMATA is below. The X6 is a shuttle route from a major transportation center at Union Station to the National Arboretum, one of Washington's prime attractions away from the National Mall. 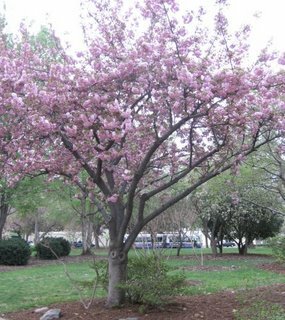 It provides an easy way for DC residents and visitors to the District to enjoy some of the area's most beautiful gardens. The X6 does not just serve Arboretum visitors, but also local residents on Capitol Hill and in the H St. and Bladensburg Rd. corridors as a fast way to go to and from Union Station and Hechinger Mall. At least half of X6 riders are using the bus for these short-distance trips. In fact, it is the local residents along the X6 route who would be hurt most by its elimination, a harm compounded by the lack of rail service in this section of northeast Washington. While I am sympathetic to Metro's need for more funding, the proposed changes would seem to do more harm than good. Elimination of the X6, and elimination of routes generally, will discourage residents from using the bus system. In some cases this will be because the needed buses simply are no longer running. In other cases it will be a matter of extra transfers making for a longer trip - and therefore making the bus a less attractive option. Fewer buses means more people driving, either by choice or necessity, which in turn will worsen the District's pollution and traffic problems. Please keep the X6 running. It is a minor route, but it is very useful to those of us who ride it regularly. When I arrived at the Arboretum this cool Sunday morning, I was immediately surrounded by birdsong, of all types. Blackbirds croaked, sparrows trilled, and warblers buzzed and whistled. Since I had not birded in earnest for about a week, this felt like a dramatic change from weeks past. I started out in the Azalea Gardens, and walked its paths for two hours. 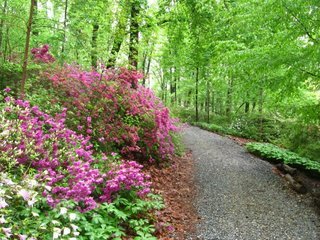 When I first entered the gardens, I heard several birds not heard since last summer: wood thrush, ovenbird, northern parula, and great-crested flycatcher. A little further in, I heard, and then saw, a black-throated green warbler. It quickly became clear that today I was going to see far fewer birds than I was going to hear. My eyes have not yet readjusted to picking birds out from the leaves, and the diffuse light made it hard to see movement in the canopy. As I progressed up the hill, I listened to the many birdsongs. I really do not mind not being able to see the singers when I know the song. I just enjoy the birds' presence through their music. The woods were filled with yellow-rumped warblers, of course. These will swarm the canopies until their sudden disappearance in May. On the way down the other side of the hill, I found another patch of bird activity in the midst of the reds, whites, and pinks of azalea bushes. Lots of white-throated sparrows were singing in this area. As I listened to the songs, I thought I heard a hooded warbler. Sure enough, one flew up and moved around on bare branches for a bit before diving back into the azaleas. I made a brief turn around Fern Valley and the lake, but turned up little new. Across the road from the lake there was a big flock of yellow-rumpeds and palm warblers. One green heron flew overhead. A black-and-white warbler sang from the woods near Fern Valley, rounding out my biggest morning for warblers since last October. Pale Male and Lola, two red-tailed hawks that nest on Fifth Avenue in Manhattan, have failed to hatch any chicks this year. The reasons for this are unknown. Here is a description of birdwatching at David Gareji, a monastic settlement at the border of Georgia and Azerbaijan. (The settlement began in the sixth century and peaked in the eighth through thirteenth centuries.) The author seems most impressed by a lammergeier, also known as a bearded vulture. A mallard is nesting in a planting box at the Ritz-Carlton in Georgetown. Female house finches in Montana have been observed to mate with the brightest red males early in the breeding season, but later in the season will mate with males with the greatest genetic difference with themselves. How they sense genetic difference is unexplained. Mason Neck State Park in Virginia held its annual Elizabeth Hartwell Eagle Festival in honor of Earth Day this year. Rain kept wild raptor sightings to a minimum, even though the park hosts at least six bald eagle nests. The festival included bird-banding demonstrations from volunteers who staff the migratory bird study at the refuge. I found this post on Amtrak and the potential for rail service in America on BlogCritics. To me, the major obstacle to much better rail transportation is the lack of adequate funding. If the government spent anywhere near as much on railroads as it does on air travel and highways, rail transit would become much more reliable and much more attractive as an alternative for short and medium distance travel. 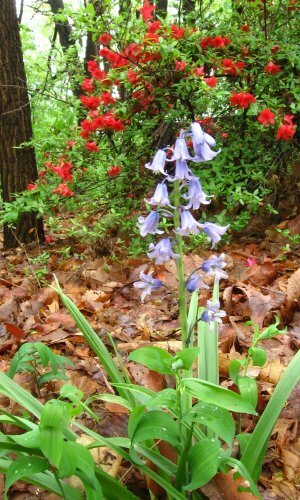 This year on Earth Day, it has been raining for most of the day, precluding most outdoor activities (at least for me). The earth around here certainly needs the rain, though. This spring has been abnormally dry so far. "Spending time outside is a huge thing. I encourage people to get outside in the environment, because the second you fall in love with it, you're going to take care of it. There are a lot of beautiful things around us to enjoy. "Get involved. There are all these publications with community events: tree plantings, trash pickups, planting buffer zones. "Vote. This is still a democracy, and in the last few years the Chesapeake Bay Foundation has lobbied for bills that upgraded our sewage treatment plants and will clean the air. Because so many people responded, that had a huge effect on why those bills passed. So many people responded that lawmakers and the governor got flooded." "People can do things like plant trees. It's a simple act, but forests provides benefits to water quality and air quality, and also provide animal habitat. Some things are simple, but bear repeating: Think about using pervious (porous) surfaces for driveways or patios, conserve water, car-pool, minimize using fertilizer on lawns, buy a Treasure the Chesapeake license plate, teach your kids about the bay. "If you have a septic system, it needs to be properly maintained and pumped out regularly. A lot of times they are overtaxed and they are contributing quite a bit of nutrient pollution to the bay through groundwater. "People can get out and volunteer and participate in water monitoring and restoration projects. There are a lot of watershed organizations that are active and trying to do the right thing." "Support and participate in a rapid transition from our dependence on fossil fuels. Global climate change is a real threat; there is really no debate about this among scientists. We must act now to reduce emissions of carbon dioxide and other greenhouse gases or leave a terrible legacy for our children and grandchildren. "Help find a way to sustain more environmentally compatible agriculture. 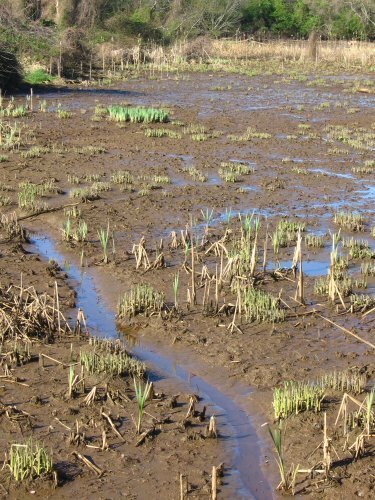 Nutrient pollution from agriculture remains the largest and most stubborn problem limiting the restoration of the Chesapeake Bay. "Change the American culture that promotes harmful sprawl development. 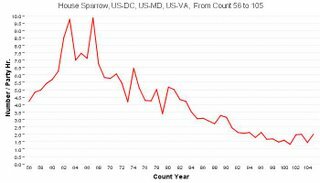 Sprawl is a threat that will in the long term undo many of the gains we are making to reduce pollution of the Chesapeake Bay. It not only harms the bay, but also damages forests and streams, forces out farms, and consumes enormous amounts of energy and public resources." Meanwhile, EarthDay.gov is bragging about President Bush's ecological achievements. The Bush Administration is focused on achieving meaningful results – cleaner air and water, and healthier lands and wildlife habitats. The nation's air is much cleaner today than it was in 1970 and progress will continue. 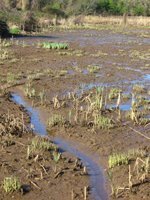 The trend of annual loss of wetlands has been reversed. Restoration and redevelopment of abandoned industrial sites is accelerating. President Bush is meeting his commitment to reduce the National Park Service maintenance backlog. It does not mention that many of Bush's initiatives on these fronts actually have pushed back deadlines and lowered goals, reduced the obligations on industry and penalties for noncompliance, or provided cover for gutting environmental legislation under the guise of names that suggest something more benign. It is hard to argue with most of these. I probably would not include the ivory-billed woodpecker, not so much because of on-going disputes, but because I do not consider it to be in the same class of visual beauty as the others listed here. If any woodpecker were to be included on this list, it ought to be the red-headed woodpecker. I would also leave off the ones I have not seen to make room for the black-throated blue warbler and eastern bluebird, two of my favorites. In the comments of my post on wood ducks, there was some interest expressed in the fact that wood ducks nest in cavities, including nest boxes. 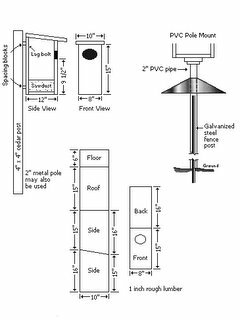 If you live near the proper wood duck habitat and are interested in building one of your own, you can find simple instructions for building a wood duck nest box at the Northern Prairie Wildlife Research Center. The figure below comes from their directions page. Note that it will probably be too late for this breeding season, but there is plenty of time to have one ready for next year. Additional materials can be found here and here. 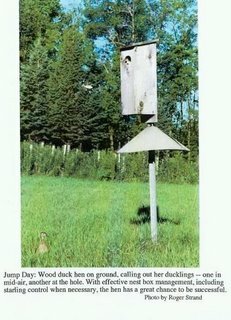 The final product should look like this photograph from the Wood Duck Society, which also offers directions for building a nest box. 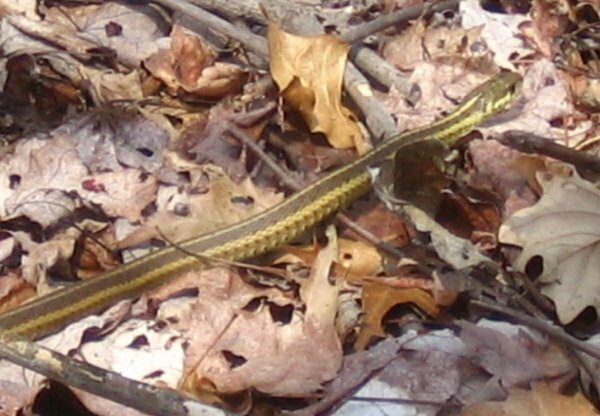 Instead of bird pictures, today I have reptiles, which have been showing themselves with increasing frequency now that the weather has gotten warmer. These pictures were taken over the weekend at the Great Swamp in New Jersey. Let me know if the identifications are not correct. For other creatures, visit the Friday Ark #83. My girlfriend and I took a little walk around Capitol Hill this afternoon. Since this is a thoroughly urbanized neighborhood, only the usual birds were around: starlings, house sparrows, a single crow. A few white-throated sparrows are still hanging around in the local squares. One mockingbird was carrying a stick, presumably for a nearby nest. I am still not seeing chimney swifts around here, even though there is a migration concentration point nearby. The succession of cold fronts is probably holding back the tide of migrants for the moment. There was one dramatic non-bird incident on the walk. Two squirrels were chasing each other about twenty feet up in a tree. Whether this was a mating chase or a territorial battle, I do not know. Both lost their balance or grip on the thin branches and fell to the ground. One apparently landed on its feet. The other landed on its back on the hood of a car and bounced onto the ground. Amazingly it seemed to have survived without major injury, since it then scampered across the street. I thought it would have broken its back. Moreover, most of the modeling done to date has been based on data gathered over just the past century, a period that has experienced a potentially confounding increase in aerosols that can blunt temperature buildups by reflecting incoming radiation from the sun. The result: Climate sensitivity almost certainly falls within the more conventional range of current predictions, with only a 5 percent chance that it will exceed 11 degrees Fahrenheit. It seems to me that the important thing to take away from the study is that it provides yet more evidence that global warming is real. The lead author is cited as saying that the exclusion of extreme estimates may persuade governments that it is still possible to make a difference by cutting back on carbon emissions. Depending on how the story is presented in the media, I worry that it may have the opposite effect. If the exclusion of higher estimates is overemphasized, it may be cited as an excuse to do nothing. I hope that will not be the case. Wheeeep! Wheeep! This ascending whistled call announces the presence of wood ducks in bottomland woods and marshes in spring and early summer. In a family known for its bold plumage and vivid colors, wood ducks stand out for their particularly beautiful appearance. The male has a bright red bill and eyes, green and white patterned head, chestnut-brown breast, and beige sides, with alternating patches of green and blue on the wings. Females, while more drably colored, have a striking white eye patch that makes them look as exotic as the males. The exotic look is no accident, as the wood duck has no close relatives in North America. Its closest relative is the mandarin duck, native to eastern Asia. 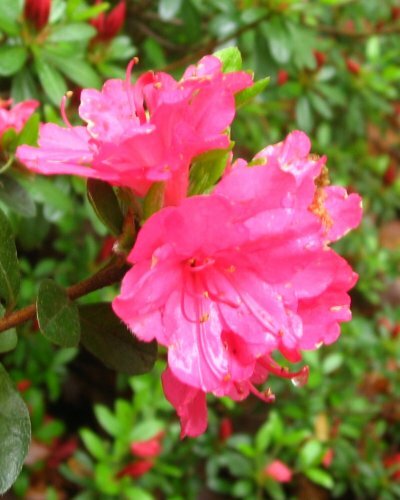 They are the only two members of the genus, Aix. Wood ducks are unique in another way, as well. 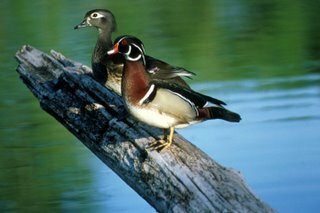 Unlike other North American dabbling ducks, wood ducks are cavity nesters. (Most dabbling ducks nest on the ground.) Originally, this meant holes in trees about 20 feet up. Now, in addition to natural cavities, wood ducks will take advantage of nest boxes. Because they are cavity nesters, wood ducks face the threat of predation by squirrels and raccoons. While natural cavities offer little protection against this threat, nestboxes can deter such predation with the use of baffles. Even though the USFWS did not see fit to list the Gunnison sage grouse as an endangered species, the Bureau of Land Management annouced that it will continue its protections for the species on BLM lands. One has to wonder, though, how strong these protections will be given the determination of some in the Congress and administration to give away exploitation rights to the same land. The Gunnison sage grouse remains one of the most threatened bird species in North America. Michigan is beginning a cormorant control program to reduce the numbers of cormorants on its lakes. Cormorants there are blamed for reducing fish populations and various other offenses, and will be controlled with a combination of scare tactics and shooting. The Columbus Dispatch informs us about the habits of the Louisiana waterthrush. The excellent Firefly Forest Blog has relocated. The bald eagle population in the Chespeake region appears to be getting a little crowded. The fight that injured Martha, one of the pair of eagles that has nested at the Wilson Bridge, was most likely a battle for the nesting territory with another female. The eagle population has expanded greatly in the region since the species' brush with extinction, and most of the best habitat is already taken. The nonprofit Wildlife Center of Virginia in Waynesboro treated six eagles last year that had wounds consistent with fights with other eagles, compared with two the year before, said its president, Ed Clark. At Tri-State Bird Rescue & Research in Newark, Del., another nonprofit facility, the bald eagle injured near Washington was the fifth one brought in this year from Maryland with fight injuries. "All of this relates to the fact that the population is reaching some level of capacity at this point," said Bryan D. Watts, director of the Center for Conservation Biology at the College of William and Mary. "The bay population has increased tenfold in the last 30 years. It doesn't take that many years to go to saturation. The bay has produced more chicks in the past five years than it has in the previous 25." 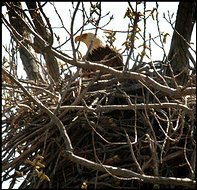 Maryland stopped doing annual eagle-nest surveys in 2004 because the population had met recovery goals, but Glenn Therres, associate director for wildlife at the state Department of Natural Resources, said he believes the number continues to grow. Birds are nesting in new territories -- last year, for instance, breeding pairs settled in two mountainous western Maryland counties for the first time in recent decades. In prime habitats such as those along the Potomac River, eagles are "packing in denser" than biologists had thought possible, occupying nests every mile or two. In the 1930s, Therres said, biologists recorded that eagle nests were generally three miles apart. This trend "may be an indication that we are getting close to carrying capacity," he said. While eagles in the Washington region have tolerated the large human population fairly well, peregrine falcons seem to thrive on manmade structures. Many nests in Maryland and Virginia are located on bridges, including one on the Wilson Bridge. The high structures approximate the falcons' natural habitat on mountains and cliff faces, and the urban location provides plenty of easy prey, especially tasty pigeons. Wildlife biologists are concerned about chicks drowning in the river when they learn to fly; other hazards include raccoons, which may prey on eggs. Attempts have been made to encourage falcons to nest in the mountains instead of bridges, but for now at least, the falcons seem to prefer the bridges. 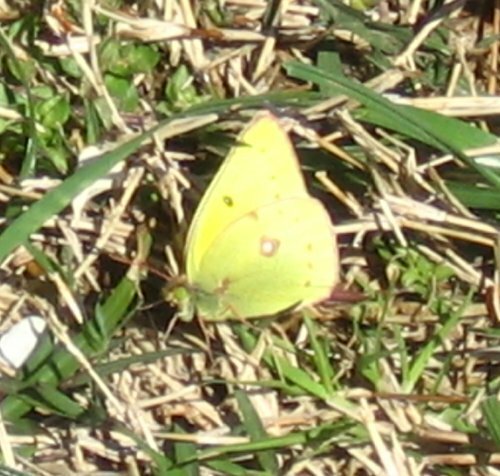 This Clouded Sulphur was fluttering in the grass at Anacostia Park on Sunday. Clouded Sulphurs are very common in this area, almost as common as the ubiquitous Cabbage Whites. Visit Friday Ark #82 for more critters. It is time once again for a meeting of I and the Bird, the blog carnival about birds and the people who watch them. This week's edition, I and the Bird #21, is hosted at Cup O'Books, a blog that is not about birding. Visit this week's edition for an outside perspective on our common obsession. 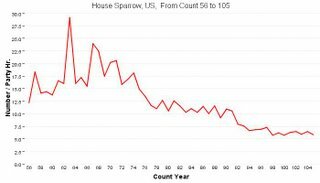 My post on house sparrows was included. I and the Bird depends on both bird-bloggers sharing their thoughts and experiences on the internet and the willingness of bloggers to host the carnival. If you would like to try hosting I and the Bird, contact Mike to set up a date. Potential hosts who have not hosted before should take a look at his series on hosting; it has some good advice. H5N1 has been confirmed in a dead swan in Scotland. It marks the first time the poultry flu has been found on the island of Great Britain. So far the flu outbreak has been a disaster for birds, but a minor health threat for humans. Most likely this individual was a migrant whooper swan. 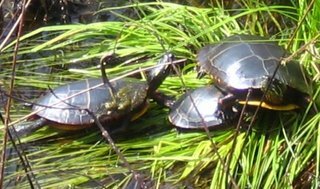 Here is a website on the natural history of Assateague Island. It includes a nice selection of bird photographs taken on the island. A green-winged teal unwittingly caused an engine fire in a plane landing at SeaTac in Seattle. The solution? Shooting off pyrotechnics in a greater area of the wetlands surrounding the airport. In eagle injury news, a bald eagle got stuck in the crotch of a tree after aerial wrestling with another eagle; it was rescued, apparently without serious injury. My post on red-shouldered hawks has been included in this week's Carnival of the Vanities. When I write for this blog, I try to write primarily about things that are of interest to me because it is hard to predict what will become popular. Sometimes a piece that I put a lot of work into will get little response, and other times something that did not require a lot of effort will draw a lot of readers and comments. One thing I did not anticipate was how much interest there would be in the story of the eagles at the Wilson Bridge. About a third of the visits this blog received since Friday were from people looking for news about George and Martha. The yellow-rumped warbler (Dendroica coronata) is one of the most familiar warblers across most of North America. While other warblers have struggled or declined, this species has thrived, and maintains stable numbers on its breeding and wintering grounds. 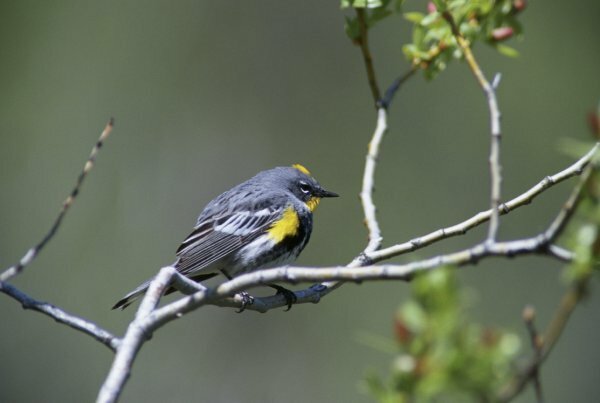 In the early stages of songbird migration, particularly in April, yellow-rumped warblers pass through the mid-Atlantic states in great numbers. Sometimes there will be so many that it will seem as if every small bird is a yellow-rumped warbler. Yellow-rumped warblers are divided into two subspecies, Myrtle and Audubon's. The Myrtle subspecies (D.c. coronata), pictured above, is primarily found in the eastern half of North America, with a breeding range across Canada and into Alaska, and some wintering territory in California. The Audubon's subspecies (D.c. auduboni), pictured below, is largely confined to the western United States. The primary way to tell the subspecies apart is by the yellow throat on most adults of the Audubon's subspecies, which the Myrtle subspecies lacks. These two subspecies were formerly separate species, and it is conceivable that they may be separated again. In the meantime, many birders - especially older ones - continue to eschew the species name for the subspecies names. 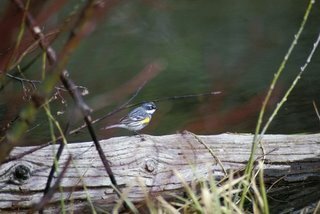 The yellow-rumped warbler is one of the few warblers that will winter in the mid-Atlantic states, and the only warbler species that will winter in significant numbers. It is able to do this because it has a more varied diet than most other members of the family Parulidae. Most warblers depend exclusively upon insects and other arthropods. During cold winters, or even cold snaps in warmer winters, the arthropod supply will mostly disappear, meaning that insectivorous birds must vary their diets or head for warmer climes. 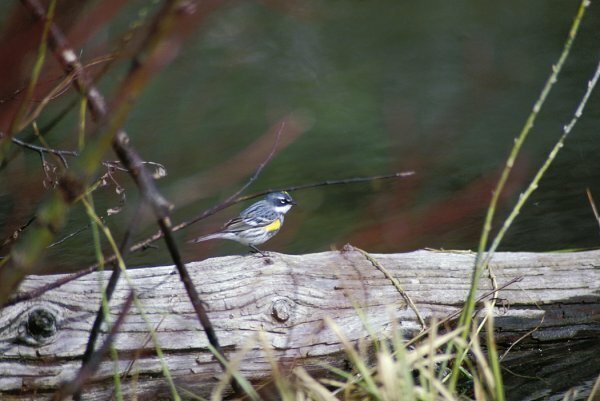 The yellow-rumped warbler takes the strategy of varying its diet. 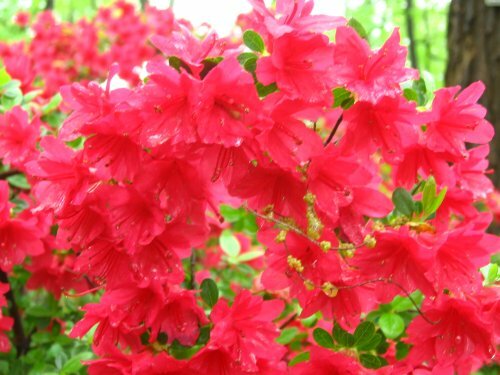 In addition to insects, it will eat bayberries, wax myrtle, and poison ivy. 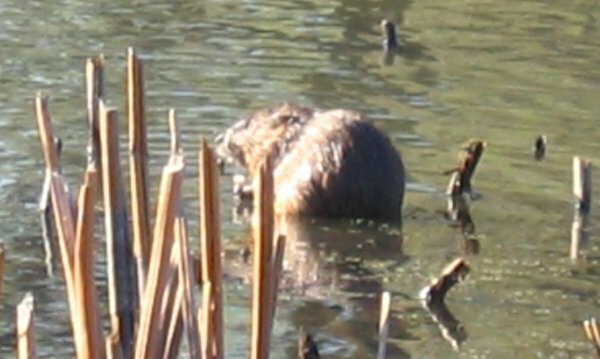 The second of these earned the eastern subspecies its name. Why would an insectivorous bird adopt this strategy? Migration is fraught with difficulty, especially when it involves long flights over open water. Species that can find a way to survive the winter without a long trip will have fewer losses due to exhaustion and stormy weather in flight. 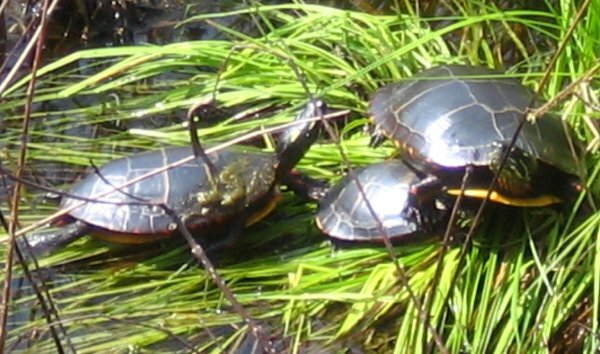 A shorter trip to breeding grounds in the spring also means a leg up on competing species. 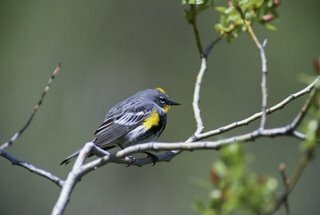 Yellow-rumped warblers can set up breeding territories and establish food sources while other warblers are still travelling, which in turn makes for a longer window for raising their young. It is no accident that this species is so abundant. For upstate New York readers: If you are planning on birding in the Adirondack Mountains this summer, you might want to look into getting a copy of a new birding guide that covers the region. It gives dates and locations for finding many of the region's specialities and includes a birding map. The guide is published by the Franklin County Tourism Office and is being used to publicize the upcoming Great Adirondack Birding Celebration. I do not see any information about the guide on the Franklin County website at the moment, but it looks like you can request one from the site for Hamilton County's Adirondack Birding Festival. It seems that George has given up on the nest. Yesterday, George no longer sat on the nest, although he fended off birds that flew near, said Stephanie R. Spears, an environmental specialist with the bridge construction project. Her theory is that a chick hatched but was done in by Saturday's chilly, wet weather and lack of food. The male could not leave the nest to find food because of the rain and potential predators, including the bird that attacked his mate. Meanwhile, Martha is doing well and should be released soon. She has been flying in an outdoor cage, so it seems that she should be able to make a full recovery. There does seem to be some hesitation about where to release her. The timing and location of Martha's release is up to the U.S. Fish and Wildlife Service, which oversees the nation's bald eagle population. Craig Koppie, a biologist with the agency, said that releasing Martha to her old territory, although standard procedure, "is asking for round No. 2. . . . I have the feeling nature is going to do what nature does, and the strongest will survive." The house sparrow is one of a handful of birds that most Americans can identify. Even most non-birders recognize this small brown denizen of urban areas. These are the little birds that we see at street corners, around fast food parking lots, and in our backyards, especially if we live in urban areas. Over the millenia, house sparrows have become well-adapted to human habitation. They nest in cavities in human dwelling and take advantage of wasted food. House sparrows became an urban species first in its native Europe, and then adapted well to their new surroundings when they were first introduced to this continent in 1851. Despite its past success, not all is well with this species. The Royal Society for the Protection of Birds is conducting a study to determine the cause of the house sparrow's decline in the U.K. and possible ways to reverse the trend. Sparrows have declined by 65% in the U.K. over the past quarter century and are almost gone from many of London's parks. The researchers are testing the impact of food supply on breeding success. Specifically they are testing if providing mealworms helps. If it works, the RSPB plans to start a campaign to get homeowners to increase the availability of invertebrates through gardening or feeding. 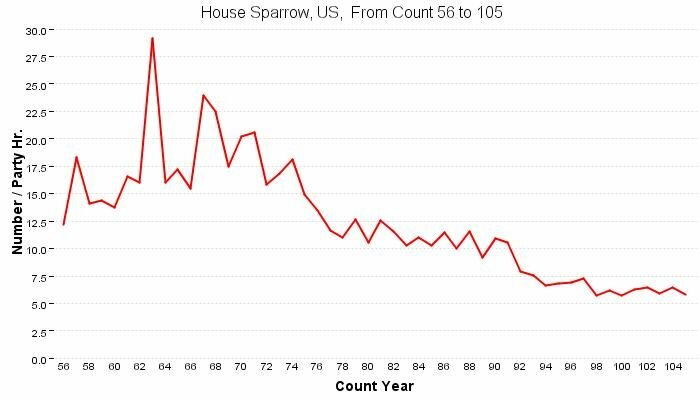 In both cases, the numbers of house sparrows per party hour peak in the mid 1960s and fall until the 1990s, when the graph seems to level off. 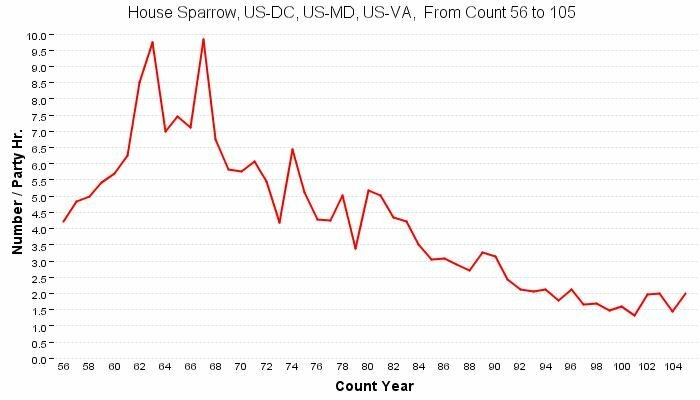 In some respects, the decline of house sparrows on this continent is a blessing for native bird species. The introduction of house sparrows is a classic case for the havoc invasive species can wreak on ecosystems. House sparrows, being aggressive, frequently outcompete native birds for resources. Where food and nesting space are scarce, this can put native species at risk. But the house sparrow's decline may be a sign of larger problems. If these historically successful birds are having trouble, could this be a sign of trouble to come for other songbirds? Until we know the causes of their decline, we have to hope that the answer is no. The 124th Best of Me Symphony is now available at its usual home at The Owner's Manual. The Best of Me Symphony highlights older posts that are worth reading again after a few months. This week's edition is based on quotes from Oscar Wilde. Gary was kind enough to include to include my October post on Chimney Swifts. At Tri-State, where Martha has been since Wednesday, Executive Director Christina Motoyoshi said Martha is improving after undergoing surgery Friday, and that veterinarians are "cautiously optimistic" she will recover enough to be released. "Dr. Erica Miller, our veterinarian, looked at Martha today [Saturday] and said she is improving," Motoyoshi wrote in an e-mail. "She has not yet regained her full strength, and she is not eating on her own yet. But, she does look more alert today than yesterday, and her wounds are healing nicely. Our hope is to release her in a week if all goes well." A quick recovery would bode well for Martha, George and the chicks. The sooner Martha can be released near the bridge, the better the chances that she will reunite with George and her chicks, Motoyoshi said. "They usually keep the same mate, the same nest, year after year," she said. "But there's always a chance that George could take up with another female." Bryan Watts, director of the Center for Conservation Biology at the College of William & Mary, said the odds are not in George's favor, given that newborns are so helpless and the demands of parenthood so great. "There's always a chance you could have a really experienced male pull off a miracle," he said, "but it's highly unlikely." 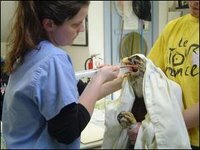 The photo above is of Martha being fed at Tri-State Bird Rescue and Research, and is included in the News Journal article linked above. You can listen to Craig Koppie of the US Fish and Wildlife Service discuss the situation on NPR here. After yesterday's steady rain and gray skies, today's sunshine was a great relief. The sky was blue, the air was cool, and there were lots of birds around - a great combination. I headed over to Kenilworth Aquatic Gardens as soon as I got up this morning, and then followed that up with a short trip to Anacostia Park. I was greeted at the entrance to Kenilworth with a smattering of bird song. One ruby-crowned kinglet sang its complex twittering song near the gate while white-throated sparrows sang "Poor Sam Peabody" here and there. One unfamiliar song caught my attention; when I turned to look for the singer, I spotted a Louisiana waterthrush about fifteen feet up in a cypress. 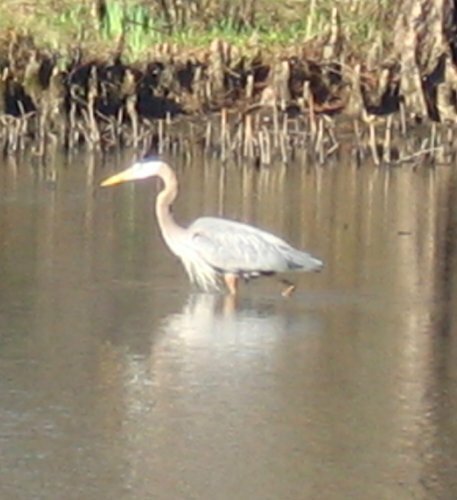 The ponds held three members of the heron family: great blue heron, great egret, and snowy egret. Snowy egrets are not that common in D.C. and only appear during migration. When I reached the boardwalk, I was treated to a quick succession of hawks: a calling red-shouldered hawk, a soaring red-tailed hawk, and a young bald eagle with crows in pursuit. As I watched the red-tail turn, I caught sight of four birds flying north in a loose line - common loons! At the observation decks I sat and watched and listened for a while. As I was getting ready to leave, three Wilson's snipe flew in and settled on the mud flats. It was great to be able to watch them and examine their plumage instead of trying to catch them in flight, which is usually the way I see them. On the first half of the river trail, the birds were joined in song by chorusing spring peepers. I believe this is the first time I have heard them this spring due to the lack of rain. Further along, I ran into a flock of palm warblers. Normally I will see one or two of this species at a time; today I saw about a dozen darting back and forth across the path. At least one was singing. At the end of the river trail I found my first barn swallows and chimney swifts of the year as they cruised over the mudflats with tree and northern rough-winged swallows. Some of the swallows appeared to be chasing the swifts, but that may just have been coincidental. 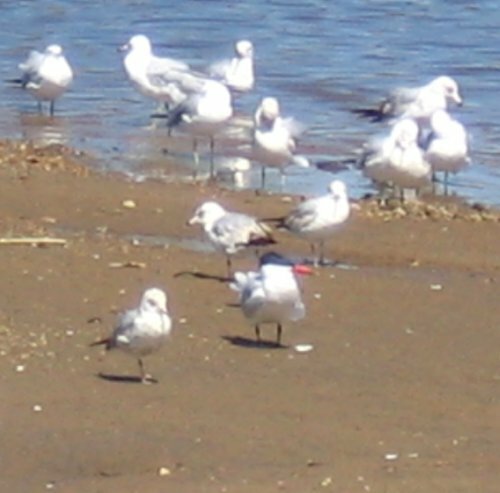 At Anacostia Park I hoped to find some migrant gulls and terns. One caspian tern was among a group of ring-billed gulls on a sandbar near the railroad bridge. Other than that the park was not all that birdy. Oddly enough there were no great black-backed gulls to be seen today. As some species are moving in, other species are departing. Today's Post has a followup to yesterday's story about the Wilson Bridge bald eagles. Since Martha was taken to Delaware for rehabilitation, George has been tending the nest by himself. Now it appears at least one chick may have hatched. So far, the male bird is caring for the nest by himself, and yesterday, he showed the first sign of feeding a chick. From a distance, bridge project environmental specialist Stephanie R. Spears could see him holding fish in his talons, then bending over the nest. Eagles shred food with their beaks and offer tiny pieces to their chicks. "I think we've got a young hatchling," Spears said from her cellphone as she watched the nest late in the afternoon. "It looks hopeful that it's feeding behavior." It is expected to be several weeks before Martha is ready to return to the nest, assuming that her wounds heal. Those two weeks will be the most crucial to the young chicks' survival, as this is when they are most vulnerable, both to other predators and the cold temperatures of early April. The prospect of the chicks not making it has led some wildlife officers to propose moving the chicks to a nearby nest, though they seem reluctant to do so. I tend to agree. It would be better to see if George can manage on his own for a short time. If he cannot, there really is not much harm done to the local eagle population. Further Update (4/9): Martha's condition has been improving and her chances of a full recovery without infection look good. Meanwhile, George seems to have the situation at the nest under control, for now at least. 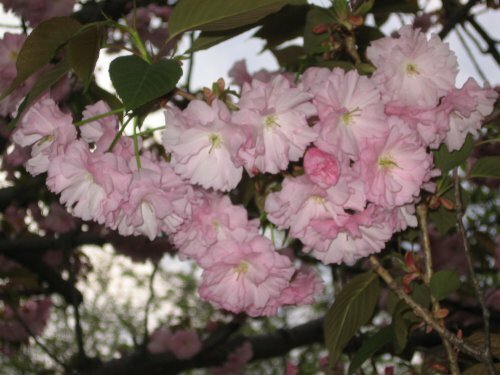 The peak for cherry blossoms is now past. The rainstorms of the past week have knocked down most of the petals. Now that the delicate white flowers of the Yoshino Cherries are mostly gone, the trees are starting to leaf out. Circus of the Spineless #7 is ready. For several years now, there has been a pair of bald eagles nesting at the Maryland end of the Wilson Bridge, which carries the Beltway over the Potomac near Alexandria. Despite the traffic noise and the construction work, these eagles have persevered to raise their offspring. This is one of two bald eagle nests inside the Beltway. The eagle pair, nicknamed George and Martha, has a new set of eggs to tend this spring. The two guarded the nest as usual until another eagle attacked Martha in an aerial duel that left Martha severely injured. Wildlife rehabilitators took Martha to Tri-State Bird Rescue and Research in Newark, Delaware, for care, and her outlook looks good. In the meantime, there is a question of what will happen to the eggs. George has been tending it for the time being, but he needs to eat, and if the eggs hatch, the chicks will need feeding as well. Wildlife managers may decide to place the chicks in another nest for care if they believe that gives them a better chance of survival.